Check Part 2 of the lesson. Root system: The part of the plant that grows under the ground. 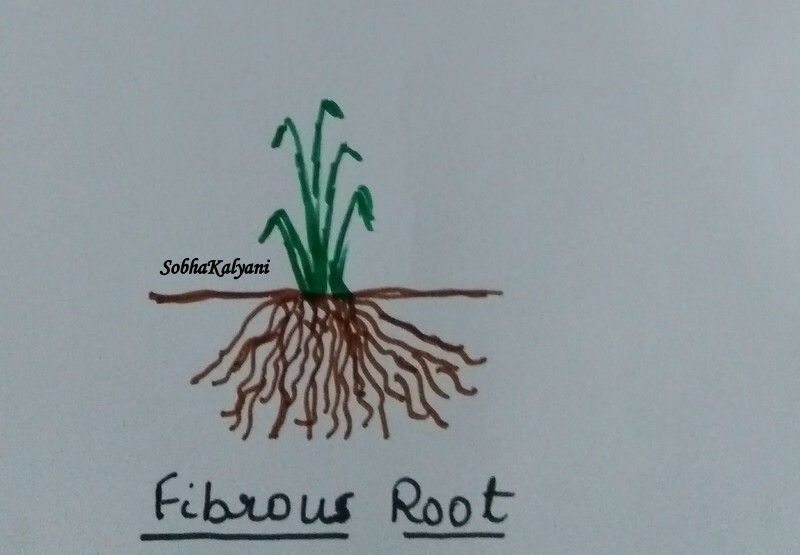 It consists of roots and root hairs. Shoot system: The part of the plant that grows above the ground. It consists of stem, branches, leaves, flowers and fruits. 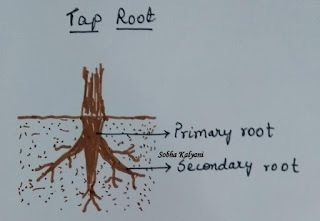 Tap root consists of one thick main root called the primary root that grows vertically down into the soil. Many branches called the secondary root grow from the primary root. 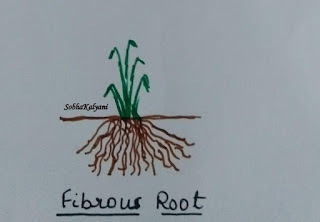 There is no main root but a number of fibre-like roots grow in cluster from the bottom of the stem and spread out into the soil. All the plants of grass family like paddy (rice) and wheat have fibrous roots. Roots fix the plant to the soil. They absorb water and minerals from the soil and conduct it to the stem. 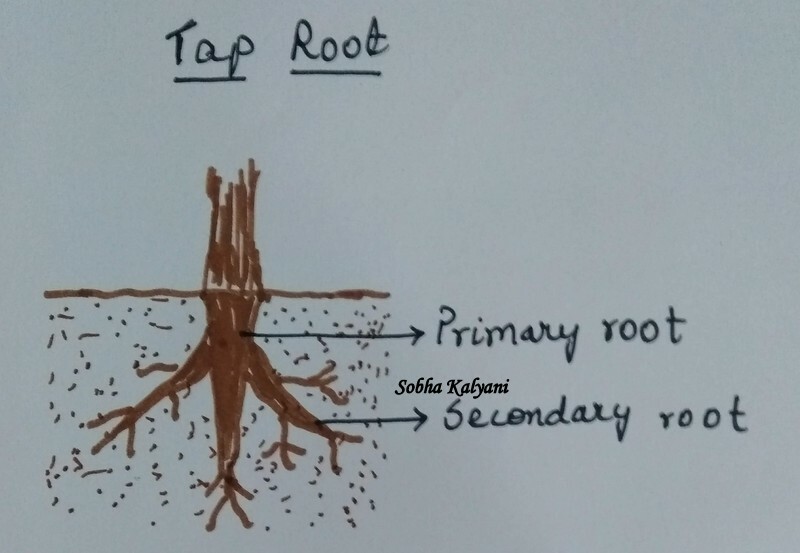 Roots bind the soil particles and thus prevent the soil from erosion i.e. from being blown away or washed away by wind / water. In some plants, roots modify to perform additional functions. Such roots are called modified roots. Roots are modified for performing additional functions like storage of food, giving additional support to plant and for respiration. In some plants like sweet potato and carrot, roots store the food prepared by the plant. Prop roots: Big trees like the banyan have heavy branches that bend down. Roots from these branches grow downwards and fix in the soil to give additional support to the plant. Such roots are called supporting roots / prop roots. Stilt roots: The thin stem of the plants like sugarcane and bamboo cannot stand erect. In such plants, supporting roots grow from the nodes of the stem and fix in the soil. They give additional support to the stem and help it to stand erect. Such supporting roots are called stilt roots. In marshy areas the soil is sticky and is covered with water. Mangrove plants grow in such areas. The roots of these plants do not get air as they remain in water. Hence the roots grow vertically upward above the soil for breathing / respiration. Such roots are called breathing roots. 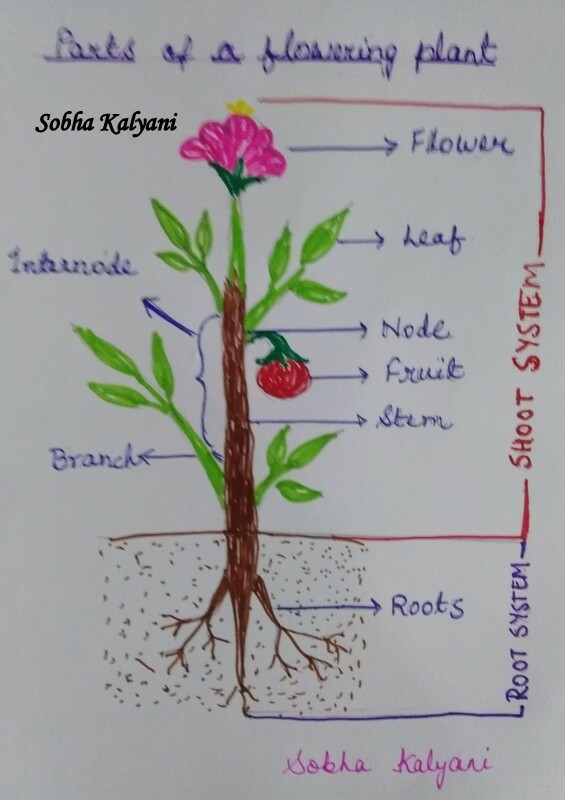 The shoot system grows above the soil and consists of stem, branches, leaves, flowers and fruits. Stem forms the main axis of the plant body. It has nodes and internodes. The point on the stem from where leaves and branches grow is called the node. And the place in between two nodes is called the internode. The tip of the stem or a branch bears an apical / terminal bud. The apical bud helps in the plant to grow taller. Buds are also present in the axiles of leaves and these are called the auxillary buds. Auxillary buds grow into branches. The stem of the young trees is soft and tender which becomes hard and woody as the tree grows. Such a hard and woody stem is called the trunk of the tree. Trunk is covered / protected with bark. Stem and branches hold the leaves in such a way that the leaves get maximum sunlight for photosynthesis. In baby plants / saplings, the green stem makes food for the baby plant. Stem carries water and minerals from the roots to different parts of the plant. It also carries the prepared food from the leaves to the different parts of the plant. In some plants, the stem modifies to perform additional functions like storage of food, preparing food and giving additional support to the plant. In plants like ginger, potato and turmeric, the stem grows under the ground and modifies to store food. The underground modified stem helps the plant to survive when the conditions are not favorable. Tubers: A tuber is an underground modified stem which is swollen as it stores food in the form of starch. E.g potato. It is small, thick and fleshy and has buds called 'eyes'. New plants grow from the eyes. It has prominently visible nodes and internodes. Bulbs: A bulb is a short underground stem which is thick and is bulb-like. The bulb bears fibrous roots at the base and leaves above the base. The outer leaves are dry and scaly while the inner leaves are fleshy and store food. E.g. onion. Rhizomes: An underground modified stem that grows horizontally is called a rhizome. It is modified to store food. E.g. ginger and turmeric. In plants like cactus, the stem is green and fleshy. It contains chlorophyll and prepares food for the plant as the leaves in these plants are modified into spines. The stem also stores water for a long period due to scarcity of water. In climbers like grapevine, the thin and weak stem gives rise to thin and coiled thread-like structures. These coiled structures are called tendrils which coil around the nearby objects and help the plant to climb. In plants like rose and lemon, the auxillary bud is modified into sharp, hard and pointed structures called thorns which protect the plants from grazing animals. A leaf is a flattened structure of a plant that arises from the node of the stem or branch. Leaves of different plants are different in shape and size. 1. Leaf blade / leaf lamina: Leaf blade is the green flat part of the leaf that is attached to the stem by a short stalk (called petiole). It contains a green pigment called chlorophyll. Leaf base: It is the region where the leaf is attached to the stem. Mid rib / main vein: It is the thick middle line seen in the leaf which has many side veins. Leaves prepare food for the plant by a process called photosynthesis. There are tiny pores on the under-surface of the leaves called stomata through which exchange of gases takes place. Plants need carbon dioxide for photosynthesis and oxygen for respiration. Excess water from the plant is given out in the form of water vapour through stomata by a process called transpiration. In some plants, leaves modify to perform additional functions. Simple leaves: A leaf with a single lamina and it has a bud. E.g. leaf of a mango tree and china rose (hibiscus). Compound leaves: A leaf that is cut into a number of small leaflets on a common stalk. E.g leaf of a tamarind tree and neem tree. Alternate leaves: A single leaf arises at each nodes alternately on the opposite side. E.g. mango leaf, sunflower leaf etc. Whorled leaves: More than two leaves arise at each node. These leaves are arranged in a whorl i.e. in a circle. E.g. oleander leaf. In plants like cactus, the leaves modify into spines to prevent the loss of water from the plant through transpiration. In climbers like pea plant, the leaf modifies into tendrils which twines around the nearby object and helps the plant to climb. In plants like onion, the leaves become fleshy to store food. In insectivorous plants like the pitcher plant, the leaf modifies to trap the insects.